In life, as in business, a strong personal network is critically important to a person’s effectiveness. This need is amplified when the person is working in a distributed or virtual team. In these teams, an individuals’ network needs to extend beyond the bounds of their home office and society into the locations and offices where their virtual colleagues work. They need to have sufficiently strong and robust relationships with colleagues in each location, these relationships enable them to openly discuss any issue that may arise, regardless of its personal or business implications. Strong relationships also mean that issues that may threaten the work at hand, but which may be awkward of difficult to raise, have a better chance of being discussed in a dispassionate and regional way. Building a strong personal network in a virtual team is a long term undertaking. You need to spend days, weeks, months and years cultivating trust and understanding with colleagues in other offices. You need to spend time with your virtual colleagues in real face to face meetings and in social settings where you get to know each other. These relationships need to extend beyond any veneer of business only into a relationship that has an appropriate personal and social depth. For many, particularly in some cultures, business networks and personal networks are considered to be separate to the point of isolation. A business relationship is exactly that, all about business, while a personal one is something that typically happens predominantly outside of the business environment. The concept of a personal network inside of the business that includes both the working and social sides is what is needed for effective virtual team work. Your network needs to be both business and personal to get the breadth and depth of insight needed to work effectively. Better cultural understanding – If a relationship is purely based on business interaction, all of those involved will miss out on the opportunity to build a stronger overall cross cultural understanding. Looking beyond purely dealing with business, with the details, facts and figures of the organisation, to the subtle and fluid world of cross cultural understanding will give everyone a greater insight into how their colleagues think, how they approach decisions and discussions and what motivates them and their colleagues on a day to day basis. This cross cultural insight will enable you to be more effective in your day to day work, to better understand not just your virtual team partners, but also your clients and customers. Better business insights – Building and expanding your personal networks to be more balanced, more social, less business focussed, you will be able to establish deeper relationships and understandings with all of your contacts. This in turn will let you better understand the business drivers prevalent in each culture, to see what motivates customers and business partners in different cultures and to understand how you need to tailor your approach to each. Without this broader, more nuanced network it is too easy to assume that everyone sees the world the same as you, that what motivates you motivates them. This blinkered and closed perspective is usually wrong, leading to many failed virtual teams and business ventures. Increased organisational productivity – The better you understand your virtual team colleagues, whether there be cultural differences between you or not, the better you can all work together toward the organisational goals. This can mean understanding the cultural differences as they impact communication styles, views on time, schedule and long term aims, different working hours and social pressure outside of work. The better everyone understands their working partners beyond the transactional, day to day work, the better they will collaborate. A more enjoyable working experience -With a well established personal network in your virtual team, work becomes more of a sociable experience. You feel like you are working with friends, trusted colleagues who have your back and who will support you no matter what. Without such a network, your work experience can be fragmented and difficult, with regular surprises, many of which will be unpleasant as events occur in other locations that you are not aware of and don’t always understand. 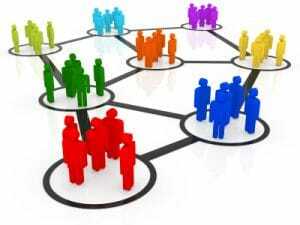 There are many ways to build your personal networks in virtual teams. Fundamentally the best place to start is by doing in a virtual world exactly what you would do in a face to face situation. You need to look for opportunities to establish both a technical and, as importantly, a social connection with your colleagues. Use face to face meetings to build relationships – face to face meetings are relatively common during extended projects or ongoing business relationships. Make the most of these visits by taking some time to socialise with your distributed team colleagues. Spending time outside of the office allows you to share experiences beyond the workplace, talk informally and build a stronger social bond. In many cultures, this post work ritual is a critical part of doing business and needs to be treated very seriously, in other cultures it may be harder to meet outside of work, but the offline meetings in the office can also be used to build your personal network. Be sociable – within reason I would suggest that exhibiting a willingness to be social is a very important part of building your personal network. If your colleagues, both co-located and virtual, sense that you are happy to socialise and to be more than a one dimensional worker they will begin to open up to you and to include you in more than purely transactional work activities and discussions. Be open to connections – Be prepared to make connections in all situations. This, again, is good advice in any business environment, but particularly in a virtual world. You simply do not know when a connection you may have made along your professional journey will reappear and how that connection may be able to help you with your personal network. Once you have your personal network in place, it is critical that you maintain it and keep it active. This is done through regular communications, through email, phone calls, video meetings and, when you are in the same geographic location, taking the chance to catch up face to face. A well developed and nurtured personal network will give you enormous insight, warnings of impending issues and a deeper pool of colleagues you are able to reach out to in times of trouble. It is, basically, a major investment in your personal and corporate future resilience. Do you have experiences with building personal networks in virtual team environments you would like to share? if so, we would love to hear from you.